It is hoped agent mediated e-commerce will be carried out as open systems of agents interoperating between different institutions, where different auction protocols may be in use. The authors argue that in order to put such a scenario to work, agents will need a method to automatically verify the properties of a previously unseen auction protocol. This, in turn poses the problem of automatically verifying desirable properties in order to trust a given auction mechanism. This challenge needs be addressed so that the business scenario of agent mediated e-commerce becomes a reality. 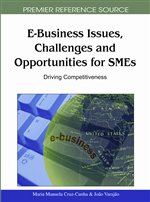 In this chapter, the authors discuss salient opportunities for SMEs in addressing the issues of enabling software agents (e.g., PDAs, mobile phones) to connect to auction houses and verify desirable properties that need to hold before engaging any transactions. Future agent mediated e-commerce will involve open systems of agents interoperating between different institutions, where different protocols may be in use; the roaming agents will need to understand the rules of engagement in foreign institutions in much the same way human agents can. This implies software agents will be engaging financial transactions and entering legally binding contracts on behalf of their owners. An agent's owner must be legally responsible for his or her agent's actions. However, such software agents may be developed and owned by different individuals or organizations, which may have conflicting interests. As a consequence, agent owners may be reluctant to delegate tasks that may cause detrimental outcomes to an agent unless they can have a guarantee that the system has certain desirable properties. For instance, if I want my agent to bid in a web-based auction on my behalf, I will need a guarantee that my agent will not pay a higher price than it should because other participants are placing fictitious bids. Can I trust my mobile phone to connect to an auction web-site in order to buy goods for the best prices available in the market? Can my mobile phone with limited computer resources be capable of ensuring an electronic auction such as eBay is fair and safe? Will my software agent be smart enough to interoperate between auction houses that use different communication settings and have different protocols? The success of such agent mediated e-commerce systems will depend mainly on the ability to address the above issues, and to develop, maintain, and augment interoperable components. These pose real challenges to the computer science community and need be tackled so that we can advance our understanding about this very important area and realize the vision of agent mediated e-commerce. Moreover, an important niche in e-commerce protocols is auctions since they usually yield to higher revenues than fixed price offerings (Zhang, 2008). Auctions are usually designed to have certain desirable game theoretic properties such as incentive compatibility (encouraging agents to bid truthfully), collusion-proofness (agents cannot collude to achieve a certain outcome), or false-name bidding free (agents cannot manipulate the outcome by using fictitious names). Game theoretic properties such as incentive compatibility rely on very strong assumptions; it is required that the property be common knowledge among the players, otherwise agents cannot be expected to follow any kind of recommendation (Guerin & Tadjouddine, 2006). To illustrate these requirements, we need to bear in mind that an auction is typically defined by a winner determination algorithm; there are several in the literature, see for example (Cramton et al, 2006). This provides the winning criteria and therefore implicitly determines the optimal strategy for participating agents. These winner determination algorithms are designed with desirable properties such as truthful bidding is optimal. If an electronic auction house is using such a protocol, it is not sufficient for the auctioneer to claim that a truth telling strategy is optimal. The fact is that sincerity cannot be assumed in open systems. The protocol in use must be published in a standard specification language so that the bidding agents can understand its rules and verify that the auction is being implemented as advertised (Tadjouddine & Guerin, 2008).